Known for its hot chocolate and churros, don't be surprised to find this cafe packed as early/or late as 5 am with people of all shapes and sizes dipping their churros into steaming cups of hot chocolate. 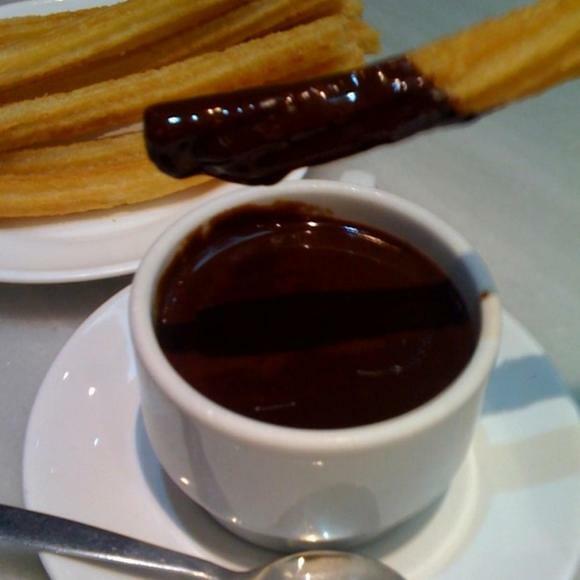 A must when in Madrid, this quaint place serves up sinfully decadent churros con chocolate. FUN way to end a night of partying with friends! We had read about this place ahead of time and it was not a dissapointment, lively busy place not far from the Sol metro stop and just before Plaza Mayor. Link I am providing best describes the place and shows a pic of store front. Pretty reasonable price, we shared one cup of Chocolate, comes in a normal size coffee cup..well for Spain anyway and 5 churros, you dip them of course.. Devine.. do try it out.